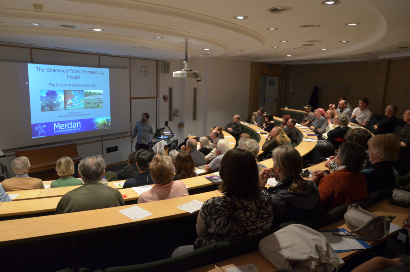 Mercian regularly give talks, lectures, presentations and training seminars to groups including historical and archaeological societies, schools, and adult education groups. If you would like a presentation for your group then please get in touch at info@mercian-as.co.uk. We can offer any of the example talks below or tailor the event to suit your requirements. 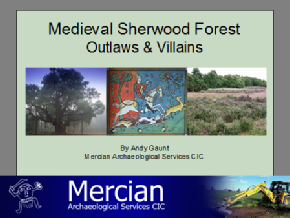 Mercian’s Andy Gaunt will take you through the history, landscape and people of Sherwood Forest in the Medieval period. Please email info@mercian-as.co.uk for more details and for information on how to book this talk for your group. Learn about Medieval Sherwood Forest it's and administration and the Forest law. Also the landscape of the forest, the woods and the heath famous as the haunt of outlaws, the Royal Palace in Kings Clipstone at its heart, and the romantic hunting landscape that surrounded it. The talk will cover much of the latest archaeological research by Mercian Archaeological Services CIC in Sherwood Forest including King John's Palace, St Edwin's Chapel and Robin Hood's Village of Edwinstowe. 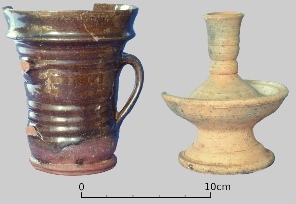 Archaeology of Medieval Sherwood Forest and King John’s Palace. 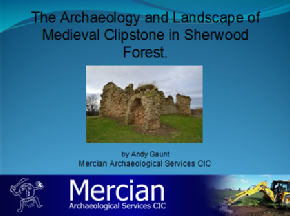 Archaeology and the designed royal landscape of Medieval Clipstone and in Sherwood Forest. Clipstone was the Royal Heart of Sherwood Forest in Medieval times. 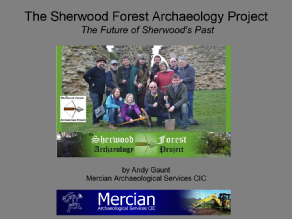 In this talk Andy Gaunt discussed the recent archaeological excavations and research from King John’s Palace in Sherwood Forest and also discusses the ‘designed’ hunting landscape at the heart of the forest, which he has recently identified and published. Mercian’s David Budge helps to train groups in pottery in the history of pottery production, pottery identification, recording, drawing, processing, quantification and sorting techniques. 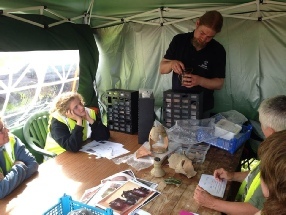 This very informative workshop is an essential for any group undertaking archaeological work or research and can be ran as a one off workshop as or part of a series. 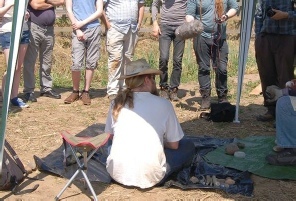 Mercian’s David Budge will take you through identifying worked flint from identification to recording and drawing techniques. Mercian’s David Budge will share some of his expertise in training you to identify finds that you may have discovered from field work or that members may have found in their gardens. Cost: Please contact info@mercian-as.co.uk to discuss the cost of this workshop. 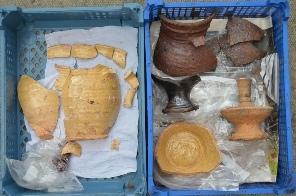 We can also give workshops on various archaeological techniques from filling in context sheets to drawing, and from surveying to report writing. Please contact us for more information and for prices.